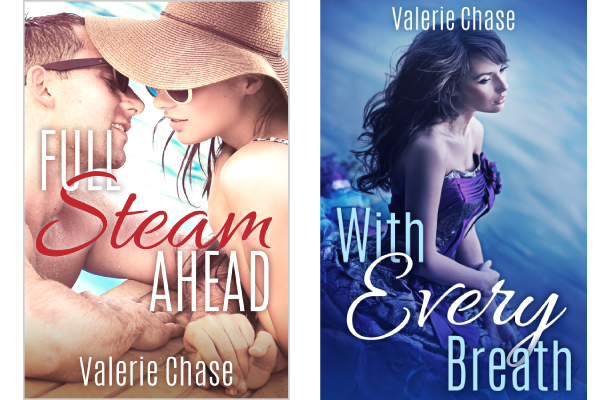 Astute fans have noticed that I've updated the covers of the Sea Swept books! 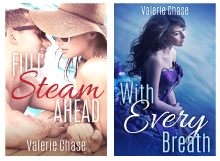 The Full Steam Ahead cover received a few smaller tweaks, but the With Every Breath cover underwent a big makeover *cue montage music* so I thought it might be fun to talk about how and why an author (or publisher) might decide to revamp a cover treatment. Why Embark on a Cover Redesign? Some authors (like myself) design their own covers. Some hire them out. Both are totally valid decisions that depend on considerations like budget, design capability, and interest, but in either path, sometimes you might feel the covers need an overhaul. 1. The cover just plain needs improvement. Maybe you no longer like the design at all, even if you loved it a few months before. Maybe it needs some tweaks to fine-tune the layout. Maybe you've learned more about what you want your cover to convey, and have realized that it could be clearer or more eye-catching. Perhaps sales have been low, and you think the cover might not be drawing in potential readers. Or maybe your cover budget is bigger now, and you'd like to upgrade to a higher quality design. 2. You want to experiment. Perhaps your cover has reached a good number of readers, but you wonder if a different style or image might generate more interest. Trade publishers do this all the time - often it takes a redesign or two to find the perfect fit for a novel or series. Although sometimes I find I liked the first cover(s) better, I can usually see why the publisher decided to try a new approach. Savvy indie authors experiment with book description, pricing and other elements to see what works best, and they know that a fresh cover could reach a whole new audience. There are lots of readers out there who might love your book but weren't hooked by that first cover. Change the cover, and you could find a new set of fans. Covers are such a key part of marketing a book, and marketing is all about experimentation and reaching people. So try something new, and see what happens! 1. First, take stock of what you have. What elements do you like? What resources are at your disposal? Can you afford a new stock image, or a new cover shoot, or a new round with a cover designer? If you are the designer, what styles or effects are within your abilities? There might be a cover treatment you love, but don't know how to do. Can you find a tutorial that will improve your skills in that area? 2. Define what it is that you want to improve. This is when you write down all the things that bug you about the current cover, and try to view it objectively. Is it dynamic and interesting? Is it conveying the promise of the book? Showing the cover to people (friends, fellow authors) who haven't read the book and asking them what the cover conveys to them is often helpful. If they think it's a sweet romance but the book is really a cozy mystery, it's time to do more research into what book covers in your genre look like. Other questions to ask: Are the colors working? What about the typography? Are the title and author name clear when the image is seen as a thumbnail? Are there any technical aspects (size, proportions, etc) that need fixing? For me, I loved the original covers, but after a few months with them I realized that I wanted a few things changed. More color, for one. 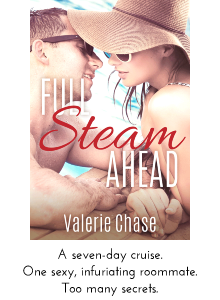 Full Steam Ahead's cover employed a washed-out effect, and With Every Breath showcased a black-and-white image. I wanted a more vibrant style. I also wanted to standardize the cover sizes (they were a few pixels off, for what reason I'm not sure. Chalk it up to being a fairly new designer! ), and change the proportions - my covers were wider than most. The last element was typography: I felt the title treatment overshadowed the cover image, and that some tweaks could bring the elements into more balance. If your designer is you, then go forth and experiment! Important: ask a couple trusted friends or fellow authors for opinions on the various iterations until you come up with the right feel. Trust me, after staring at the cover for hours, you won't be able to make objective decisions between four different font options or whether the drop shadow looks good! The other key for author-designers is to take breaks. When you have something you like, sleep on it before declaring it final. In the morning, you will have fresher eyes and a little distance, and can evaluate whether further tweaks are needed. After making changes, sleep on it again. If you hire a designer, make sure you clearly lay out what you're looking for: if it's tweaks, be clear about each change you want and how you want it done. If you are looking for a whole new image, color palette or feel, make sure you convey that. What happens if you are stumped and your current designer isn't coming up with anything that inspires you? Try searching for a new one - everyone has a different style and skill set. In my case, a few tweaks were all that was needed for Full Steam Ahead. I still loved the image, and had improved in my graphic design abilities such that I could deepen the color and bring it more into line with what I envisioned. I also tweaked the typography and text effects. I've also learned a lot more about shading and ways to make text more visible: in FSA Cover: Original Jam, the photo is pretty light, and the white text could stand out more. In FSA Cover: The Remix, the author name in particular is way more readable. There's a definite color palette, and the shadows and highlights are more stronger, giving more depth to the image. And I tweaked some minor things about the typography that had bugged me. For this book, the original image proved to be more of a problem. Though I love it and feel that it reflects Yasmin and West together, after much experimentation I still wasn't happy with the color, or lack thereof. Maybe a more experienced designer could have done something with it, but I couldn't, and Yasmin is so passionate and fun that she deserves a dramatic photo to represent her! So I went searching for a new image, and found the one you see above right. It has fabulous color that I could deepen and tweak, and since it reminded me of a scene in the book (the photo shoot!) it felt like a perfect fit. I swapped the colors of the sans-serif and script fonts, and tweaked the typography so that it felt in balance with the image. Voila! 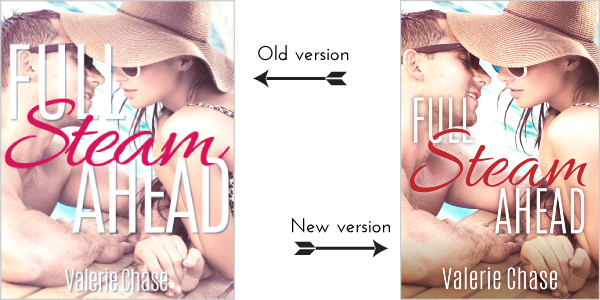 Instant (ha, more like week-long) cover revamp! 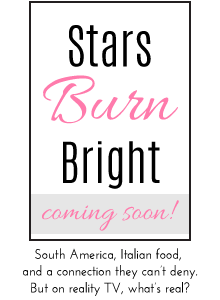 When the new cover is finally finished, you're not quite done yet! 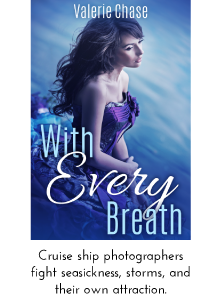 Now is the fun part: sharing the new cover with the world :) Make a list of everywhere the cover needs to be updated: your website, Goodreads, all sales channels, Facebook, Twitter and other social media sites, and even in review copies of your ebook that you send out. A cover redesign can be a lot of work, but can also be totally worth it. The cover is the face of a book, the first chance (and sometimes the only chance) that book has to hook a reader. So if you're interested in the behind-the-scenes process for book covers, or you're thinking of having your own cover redesigned, I hope this helped! Have any of your favorite books had their covers revamped, and did you think it was a good move? 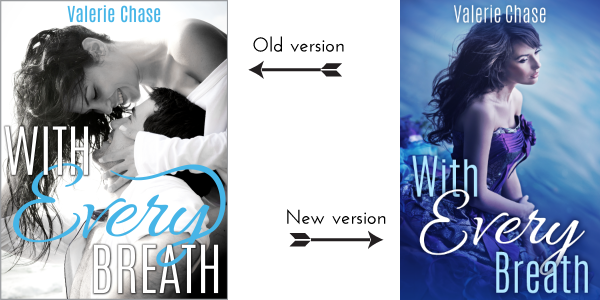 If you're an author, have you done any redesigns for your books?